Background: St George was born in Palestine. At 14yrs, his father died and a few years later his mother. 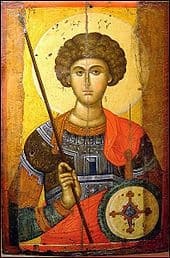 St George followed in his father’s footsteps and became a soldier. However, when all soldiers were ordered to worship and offer sacrifice to Roman Gods, St George loudly objected. Proudly proclaiming his Christian faith, he was tortured and executed by decapitation. He is the Patron Saint of numerous countries as well as professions and sufferers of multiple diseases. His Feast Day is 23rd April.